Kitchen! Kitchen! : Roasted potatoes and brocooli salad...........an encore...at kitchen! kitchen! Roasted potatoes and brocooli salad...........an encore...at kitchen! kitchen! a dusting of goat cheese. This salad served with my MMH dressing is just screaming with delight! 4 medium size red or yukon gold potatoes thickly sliced - seasoned with salt and olive oil; roast in the oven for 50 minutes until golden brown and a little crispy. Mixed everything in a large bowl, top with goat cheese shavings, and serve with MMH dressing. You may even add some well deserved crisped bacon bits ! A great side dish for just about anything...especially a big thick juicy steak! 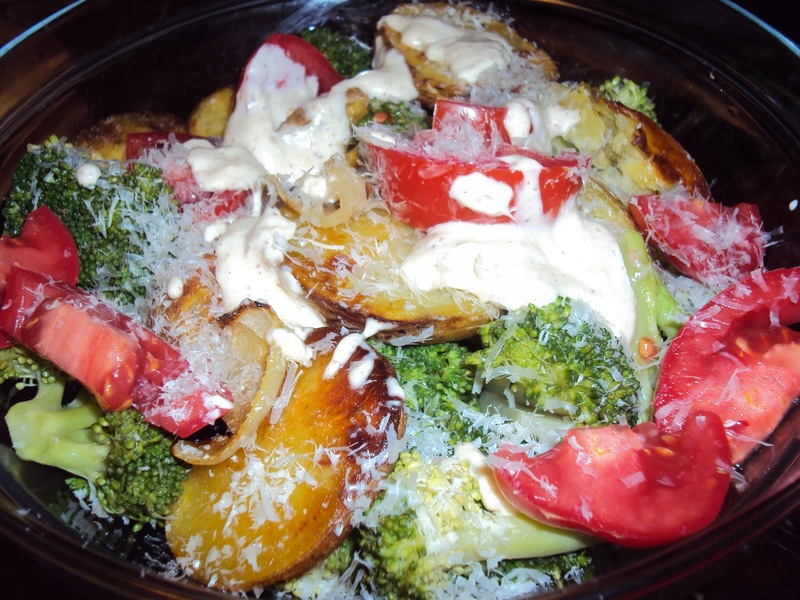 Try this dish and you will change your mind about broccoli!